I have been in Los Angeles for the past two months. I’m part of a team that includes a Russian, an American or two, the Irish and British, several Indians, a Finn, of course all of you that got me here and a Robot. We all bring something different, but we are all working towards the same thing: understanding more about human movement. Even the Robot. 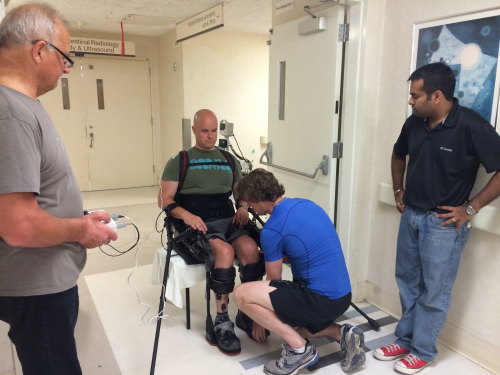 This is the short-term goal but my aim remains – to help to fast-track a cure for paralysis. I am approaching this the way I approach athletic pursuits. So, I’ve been breaking my personal bests in my Ekso Bionics robotic legs adding over 10,000 steps a week. Piers White, head of The Mark Pollock Trust (www.markpollocktrust.org) is moonlighting as my trainer and Simone George, my fiancée, provided our intellectual integration into this world of active scientific advocacy. The titans with whom we are privileged to collaborate at UCLA are led by V. Reggie Edgerton, distinguished professor of integrative biology, physiology and neurobiology, Yury Gerasimenko, Ph.D., St. Petersburg’s Pavlov Institute’s professor and director of the laboratory of movement physiology and Dr. Dan Lu, MD,Ph.D. As I train in my robotic exoskeleton their team of scientists are tracking what is going on, if anything, in my paralyzed legs. Our primary objective is to determine whether we can improve posture and stepping using two novel ways to neuromodulate (excite and affect) the spinal cord. All four men were as completely paralysed as I am; two of the four had some sensation below their injury. They can all now voluntarily move their hips, ankles and toes and have displayed improvements in their overall health, including an increase of muscle mass and the regulation of their blood pressure. All four men are also able to bear weight independently. Reggie Edgerton, who has been conducting fundamental research in this area for 38 years, says: “This is a wake-up call for how we see motor complete spinal cord injury. We don’t have to necessarily rely on regrowth of nerves in order to regain function. The fact that we’ve observed this in four out of four people suggests that this is actually a common phenomenon in those diagnosed with complete paralysis.” And Susan Harkema says: “We have uncovered a… new intervention strategy that can dramatically affect recovery of voluntary movement … even years after injury”. When she joined us at The Science Gallery’s Fail Better exhibition she described her initial reaction to her patient moving his toe as simply: “Holy s***!” After all the purpose of the study was to learn more about nerve pathways, not to make patients move. So, they now know what I have suspected to be true. I plan to support the next phase of the epidural implant research in every way I can; this is something Simone and I have been doing for the past year in our roles as directors of the Reeve Foundation. While I will not personally benefit from the epidural implant just yet – the subjects for the next phase of this human trial will have broken their backs higher up than I broke mine – this is for good reason. They want to repeat what they have learned in the first four subjects, including better understanding improvements in blood pressure and the cardiovascular effects of paralysis, some of the things from which my lower injury spared me. I also plan to continue to explore ways that this electrical stimulation technology might, with other interventions, produce wins for people with all types of spinal cord injury. That is why the Trust has moved us here to LA right now, and why I am walking on and on and on, one step at a time. We continue to balance acceptance and hope: to be excited enough by the possibilities this collaboration presents to have made it happen, all the while accepting that I will roll home in my wheelchair in a few weeks content that the scientists have useful data with which to progress this work on behalf of all those living with paralysis.